Liked this post? Inform your loved ones..
A Medical Scientist with background in Cancer Pharmacology. Moreover, Fawaz is also a Stem Cell Biologist with speciality in Endometriosis. He has both original articles and review articles published in peer-reviewed international journals. It can be hard to find a CBD oil that helps you get off the opioids and the pain that brought you to them in the first place. Getting off opioids when you are addicted is a monstrous task for just about anyone. It is no wonder then, that according to the American Addiction Centers the opioid relapse rate is 91%. But does CBD for opioid withdrawal do a better job than regular opioid withdrawal treatments? What is the Best, Most Efficient Treatment for Someone Addicted to Opioids? 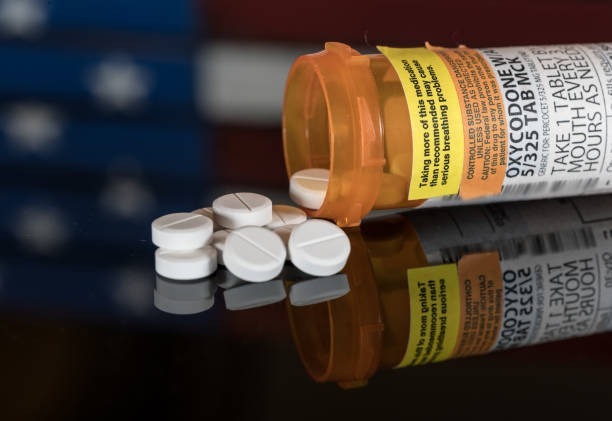 Opioid overdoses increased by 30% from 2016 – 2017 nationwide. Of that, the mid-west had a 70% increase during the same period. About 80% of heroin users have misused prescription opioids before. Between 21% and 29% of patients (~11 million) prescribed opioids for chronic pain misuse them. It is estimated that 4% – 6% of people misusing prescription opioids, transition to heroin. 64,000 Americans died from a drug overdose in 2016. Opioid abuse in the United States is 56% higher than in the rest of the world. It turns out that you adapt to the presence of opioids in your system, only after using opioids for a week or two. Your body reduces its natural production of endorphins (opioid analogs) and it ramps up adrenaline production to counteract the opioid’s sedative effects. After that, you are hooked and any attempt to stop will result in withdrawal symptoms. Would you have taken opioids, knowing this up front, or would you have rather spent some time looking for alternative pain medication? Our review is based on user testimonials, lab tests (cannabinoid profile), purity, concentration, and price. For comparison reasons we have taken the best value CBD oil package offered by each manufacturer, and the current best value special offer. According to the National Institute of Drug Abuse, every day more than 115 Americans die due to opioid overdosing. People are often prescribed opioids for pain treatment by their regular physician. According to Reuters, prescription painkillers kill 91 Americans each day and painkiller sales have quadrupled during the last 20 years. But while opioids just mask the pain (instead of addressing what is causing the pain), they are also highly addictive. Many people end up abusing their prescribed medication. And even worse, later on, they may even switch to heroin or fentanyl. According to the NIH, 33,000 Americans died due to an opioid overdose in 2015. 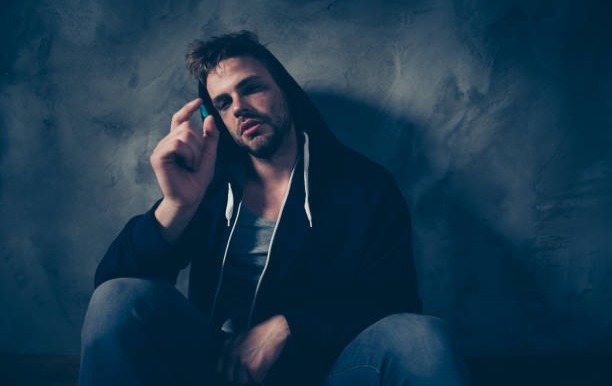 If you are looking for the best and most effective opioid withdrawal treatment, you’ll find that the most promoted, accepted and well-known treatments are the least effective. While the most effective methods are hardly recognized at all. Although most Americans believe in rehab as if it were a religion, finding success rates of different rehab programs is extremely difficult. Besides that, in-patient rehab is incredibly expensive; even a one-month non-profit drug addiction treatment could cost as much as $28,000. Stopping cold-turkey almost always leads to withdrawal symptoms. Besides a craving for the opioid rush, people actually get physically sick. Consequently, the number one reason people relapse is withdrawal symptoms. By gradually taking less and tapering down dosages, it is possible to control the severity of the symptoms a little. It’ll take half a day to a day before the first withdrawal symptoms set in and they can last for several months. Cannabidiol is one of the opioid addiction treatments that is, so far, barely recognized. Yet, it is scientifically proven to be highly effective. In fact, major scientific studies of recent years show that cannabidiol and cannabis, in general, are effective opioid-exit treatments. In 2014, Dr. Marcus Bachhuber researched opioid overdose mortality in the United States between 1999 and 2010. He found that medical cannabis laws can be associated with a rather significant decline in opioid overdose mortality rates. According to his analysis, overdoses fell by no less than 25% in cannabis-legal states. In April 2017, a study conducted by the University of California in San Diego concluded that a 23% reduction in hospitalization related to opioid dependence was achieved, as a result of (high CBD) medical marijuana use. 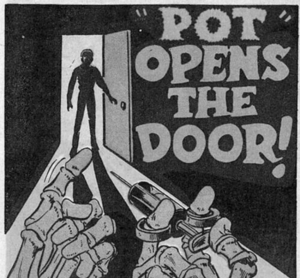 During the 50’s and 60’s, cannabis or marijuana was portrayed as the evil gateway drug, meaning that those who use it supposedly are prone to transition to drugs like heroin and cocaine. Scientific studies, however, debunked this propaganda and proved that this was a false association. In addition, recent studies show that it is actually the complete opposite. Cannabidiol and cannabis in general, make it easier to stop using opioids. You don’t need to be a scientist or analyst to see the incredible similarities when comparing the opioid withdrawal effects and CBD’s list of health benefits. Medical doctors prescribe opioids to treat pain, but opioids merely mask pain and on top of that produce a tolerance. This means that the longer you use them the less they work. CBD, on the other hand, treats inflammation, which in most cases is the root cause of pain. Cannabidiol is also a highly effective pain reliever and ideal for chronic pain as it neither causes tolerance nor dependence. Opioid withdrawal always involves anxiety and depression. CBD and medical cannabis have both antidepressant and anti-anxiety properties. Also, in this case, the science is there to back it up. These obvious physical opioid withdrawal symptoms are also effectively treatable with cannabidiol. If you want to know the science behind it, read our article on CBD for nausea. When you are feeling terrible due to withdrawal, sleeping bad and insomnia only make things worse. They exhaust your resources and reduce your body’s ability to cope with the withdrawal. This closes a vicious circle that is hard to escape from. The natural ability of cannabidiol to make you sleep better and longer at night while giving you loads of energy during the daytime can help you. We’ve reviewed the best CBD products on the market especially suited for opioid-exit therapy. Choose your preferred brand or list through all of them. 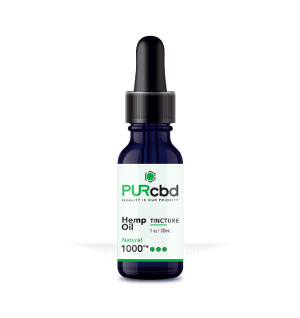 CBDPure 600 is the highest quality CBD oil we have come across. Therefore, it is iDWeeds number one pick for opioid-exit treatment. CBDPure’s reliable lab test results show an outstanding cannabinoid profile and the 90-day money back guarantee means it is a zero risk purchase. Cannabidiol Life 3000mg oil is a high concentration CBD oil with 100mg/ml CBD. It has a highly diversified cannabinoid profile enhancing the ‘entourage effect.’ Besides being high quality, the oil is highly effective and optimally suited for opioid withdrawal treatment. CBD American Shaman Hemp Oil Tincture 750 has the best cannabinoid and terpene profile we have come across. Their lab tests are of industry benchmark quality guaranteeing the highest quality and consistency. The only reason it does not rank number 1 in our iDWeeds ranking list, is because you have to pay for the extra quality. This is without any doubt the best opioid-exit CBD oil money can buy. PurCBD is organically grown in Colorado and free of Pesticides. Pur’s cannabinoid profile only shows CBD and the legal amount of THC, which have the strongest synergetics contributing to the ‘entourage effect’. Such small amounts of THC are not enough to get you high or show on a drug test but do contribute to your health. PurCBD focusses especially on customer care and they make sure your orders are handled with extra attention. 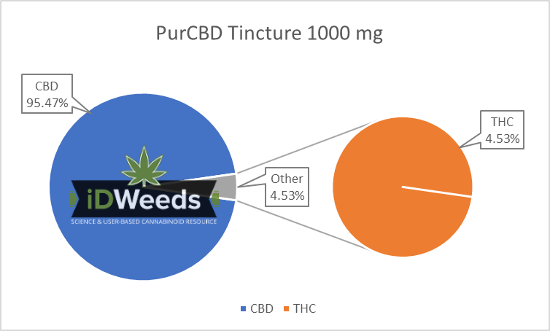 In addition, we have a 10% iDWeeds coupon discount especially for you; check out the PurCBD review here. 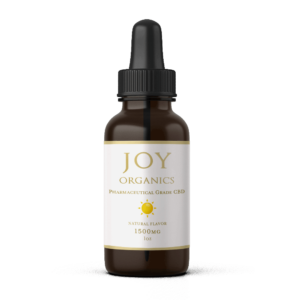 Joy Organics CBD Oil Tincture 1500 is raw CBD oil that is full-spectrum due to the rich terpene profile. Because the oil is high on CBDa (raw CBD) and terpenes it is extra therapeutical and a good choice for opioid-exit therapies. Be sure to start your CBD treatment with full-spectrum, lab tested, completely organic and high-quality CBD for the best price to avoid disappointment. © iDWeeds - Consult your (Cannabis) physician before use. 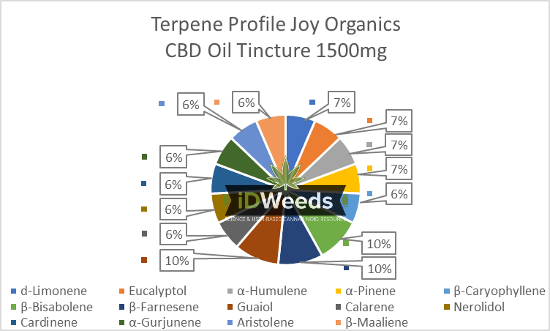 iDWeeds is an educational cannabinoid resource driven by its users feedback and scientific research. We do not sell or distribute any CBD/cannabis products. We solely review CBD brands based on third-party lab tests to protect users from fraudulent CBD scams.